Honey has a glowing reputation. The Ancient Greeks believed that honey instilled poetry and wisdom in us, carried to Earth by the gods. In more modern times, many honey has been hailed as the healthy alternative to sugar, a promoter of overall wellness, and a purported natural 'treatment' for everything from sore throats to bacterial infections and even fertility. And many go so far as to advise that raw honey is the only way to get the real health benefits of the ingredient. The honey market's value has climbed - even amid concerns over sustainability - and specialty supermarket sections and free-standing stores have cropped up. But honey may not be all it's cracked up to be. As obesity continues to plague the US (and much of the world), sugar has been identified as a primary culprit in the epidemic. Sugar is quickly absorbed into the blood stream, and is considered empty calories. We are supposed to consume about seven teaspoons of sugar a day. Currently, Americans' diets consist of a daily average of more than 19 teaspoons of sugar a day. There are about 16 calories in each of those teaspoons and carbohydrates are about all your body can glean from the sweet crystals. And high-sugar diets are a common theme in the unhealthy Western Diet, raising risks for heart disease, obesity and diabetes. But we do love our sweets, so health experts have tried to suggest alternatives, and honey has been foremost among them. Honey is actually sweeter than sugar is, which means, in theory at least, that you could enhance flavor equally with a smaller quantity of honey. But honey actually has a higher calorie count. It may have more minerals, which looks better on a label but, in reality, these are such trace amounts that they don't offer any real advantages. So, while cutting sugar intake is a good idea, stocking up on raw, organic honey instead might not be. Honey's reputation as a medicine is not wholly unfounded. Some honey - particularly Manuka honey - does indeed have antibacterial properties. One byproduct of enzymes in honey is hydrogen peroxide, a powerful germ killer. Plus, honey's texture and consistency are good for keeping wounds clean, and bad for bugs that might want to infect them. Honey is moist and its gooey consistency means it can easily spread over and stay over wounds while keeping the tissue from becoming dry and fragile. The sticky substance is also adept at breaking up biofilms that allow bacteria to accumulate and multiply. It is particularly well-known for fighting bacteria like staph, salmonella, E. Coli and certain bacteria that can infect the gut and cause ulcers. However, scientists can only say this for sure about Makuna and Malaysian Tualang honey. We don't know yet whether local home grown honey has the same potency - or safety. A hot cup of tea with some honey stirred in certainly sounds like it would make you feel better. But it's difficult to say for sure that it will. When you have a cold, contact with warm water (from tea) may help to bust up phlegm that blocks your airways. Nasal congestion often causes people to breath through their mouths more than normal (especially at night), irritating the throat. Coughing, too, is rough on the throat. But some suspect the real secret to the soothing qualities of a cuppa is in the honey. There studies that suggest that honey does work as well or better than cough suppressant drugs like Robitussin. Most of these, however were considered by the academic world to be widely misinterpreted by the media. One of the findings that seems to have given the honey trend some additional legs came from a study that said there was 'no difference,' statistically speaking, between honey and one particular cough suppressant. Some academics have argued that the cough suppressant in question, dextromethorphan, is not particularly effective to begin with, and the study reported 'no difference' in effectiveness, meaning they could simply both work poorly for treating sore throats. 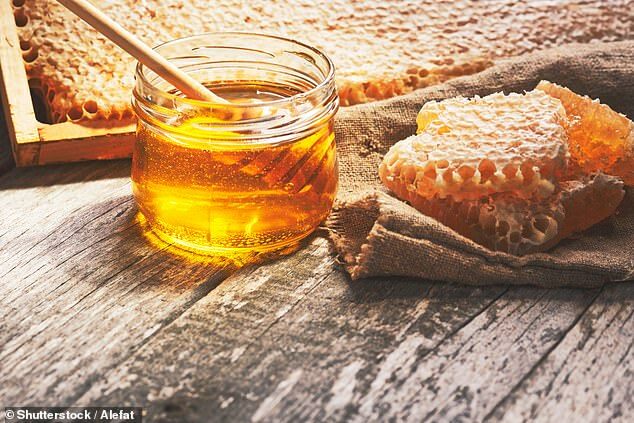 As is the case for its benefits for wound treatment, the moisture and viscosity of honey may be somewhat soothing to irritated tissue and if the sore throat has been caused by a bacterial infection, honey's antibacterial properties may go to work against the germs. A few years ago, honey seemed to suddenly become a hot topic of scientific research. One of these, conducted in 2011, compared menopausal women taking a honey 'supplement' (it was just honey) to those taking estrogen and others taking nothing. Menopause comes with an estrogen decline that often coincides with impaired memory for women. The honey-taking women seemed to have slightly better memories, and thus local, organic (and expensive) honey got a new identity as 'brain food,' and even a trendy New York City restaurant, backed by a neurologist (but spear-headed by his actress sister), called Honey Brains. It's true that honey contains antioxidants which have protective effects against cell damage that occurs as we age. But after that study's publication in 2011, Dr Natalie Rasgon of the Stanford School of Medicine, who studies estrogen and cognition in women, was deeply dubious in an interview with Reuters. 'This is not a scientifically rigorous study,' she said. 'Assuming potential efficacy of the honey, there is no preexisting knowledge of a mechanism. As for fertility, studies assert a range of possible reasons and ways honey could help - but the main thin they have in common is their small size. One 2013 study said that intake was a 'potent fertility booster' - in 18 rats. Studies on honey's benefits for women are mostly based on the vague effects of amino acids on the uterus and ovaries, or on the tendency of honey (and cinnamon) to boost blood flow to the reproductive organs.